Werowocomoco is America’s Troy. The once-lost city on the shore of what we call the York River was a regional seat of power for centuries. When Europeans arrived in Virginia, Werowocomoco’s version of King Priam was named Wahunsenacawh, also known as Chief Powhatan. His capital city and the vicinity became the locus of interactions that set the blueprint for European-Native relations for the next two centuries. 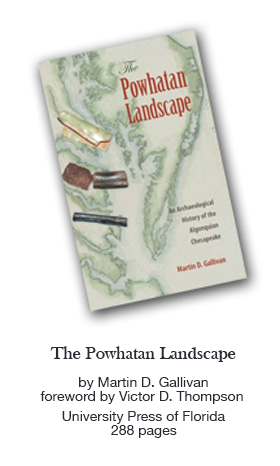 The stories of the Powhatan landscape have become embedded in American culture. The legendary intervention of Pocahontas in the execution of John Smith is as well known to Americans as the legend of that nifty trick Odysseus pulled with the big horse. Beyond the characters depicted in the Iliad, very little is known about the Trojans themselves and it’s much the same with the Powhatan people, whose religious and civic capital was Werowocomoco, but who were part of a vast Tidewater chiefdom that stretched from the Eastern Shore to where I 95 now runs. You begin the book with John Smith’s depiction of a ritual conducted by a Pamunkey priest, a conscious decision, you say, to lay the book’s foundation well outside the usual scholarly focus on English colonial contact. In a scholarly sense, what’s the difference between this story and the Pocahontas intervention story? Yeah. Good question. This was what the Powhatans referred to as a “conjuration ceremony,” aimed at determining the intentions of the English colonists. The ceremony involved the construction of an elaborate diagram — effectively a map that represented the Powhatan world. After the ceremony was complete, the Powhatan priests who conducted the ritual explained to John Smith what it meant. By starting with this ceremony, rather than the Pocahontas rescue story, we’re begin to approach an indigenous perspective — the view of the inhabitants of the region. We don’t have Pocahontas’s account of her saving John Smith. Or Powhatan’s account. Or the man wielding the ax. We only have John Smith’s account of that event. He is a mostly reliable witness, but Johns Smith’s accounts often center on self-aggrandizing narratives about John Smith. Do you believe these incidents actually occurred? I suspect both happened in some way, shape or form. I don’t know of any other examples in the Algonquin world of something like the Pocahontas-John Smith story, so it’s difficult to place this event in a cultural or historical context. However there are many examples of American Indians who constructed elaborate maps or representations of regional landscapes. These maps are really interesting, first of all because they demonstrate that many American Indians had an awareness of huge expanses of geography. Secondly, the ways they’re drawn are radically different than what we think of as a map today. There are different conventions, tropes, icons on these indigenous maps. The conjuration map, for example, involved concentric rings of corn and sticks surrounding a fire. Representations like this one are a good starting point for understanding of a Native sense of place. Well, in chapter two, I take a look at two Native maps and two English maps that depict the same landscape of Tidewater Virginia, or what the Indians called Tsenacommacah. These include the map from the conjuration ceremony and a remarkable artifact referred to as “Powhatan’s mantle”. Powhatan’s mantle is four deerskin robes sewn together. There are shell beads sewn into these robes depicting a complicated set of icons. These include 32 round circles and three figures. One of these seems to be a giant human being. To one side of him is an animal, possibly a deer. On the other side is another animal that may depict a wolf or a cougar. A number of scholars have interpreted this as another representation of the Powhatan world, one emphasizing the chief’s perspective. The 32 round circles likely represent the 32 tribes which were incorporated within the Powhatan chiefdom during the late 1500s and early 1600s. The three central figures are a bit of a mystery, but the central figure is thought to be Powhatan, the paramount chief. One interpretation of the animal figures is that they represent two different lineages that came together at the beginning of the Powhatan chiefdom that were the basis of Powhatan’s authority. So the animals would represent bands or tribes? Probably even bigger social groups than that. There were two different ceramic traditions that combined at the beginning of the Powhatan chiefdom. One is associated with the Virginia Peninsula, between the James and York River. The other is associated with the Middle Peninsula, between the York and Rappahannock. Some scholars think that the Powhatan chiefdom was created when these two groups formed an alliance. Is the Powhatan chiefdom similar to, say, the Iroquois Confederacy? There are some similarities, though we use the word “chiefdom” because of the central role of hierarchy in the Powhatan world. The Iroquois emphasized egalitarian decision making. Does that mean everyone was equal in that society? No, but there was an emphasis on shared decisions and consensus-making, and there was no paramount chief of the Iroquois. To use a federal government metaphor, you might think of Werowocomoco as similar to Washington, and a place like Kiskiack as Richmond. There was power and some ceremony within Kiskiack, though nothing on the scale you would see from the seat of power in Werowocomoco. What was the basis of this power? I argue in the book that the primary source of Powhatan’s authority came from the power of place. Some locations in Tidewater Virginia — including Werowocomoco — represented sacred spaces infused with spiritual power. The archaeological research we conducted suggests that Werowocomoco was a place of ceremony and a sacred space for hundreds of years before Powhatan was even born. Powhatan moved to Werowocomoco as he consolidated control over a regional chiefdom that was based on military force and a regional system of tribute. Powhatan monopolized the flows of copper — a highly valued exchange item — coming into the region. He also extracted tribute in the form of surplus corn from groups across Tidewater Virginia. By moving his capital to Werowocomoco, a ceremonial space in the middle of the Virginia Algonquian world, he was able to bolster his regional authority by placing himself and his family within a place of sacred power.